Let’s consider a hypothetical and unlikely situation. An up-and-coming actress is faced with a choice of two jobs. One is a stage play, and the other is a movie. Apart from the medium, everything is equal: the pay, the length of the initial engagement, the size of her part. 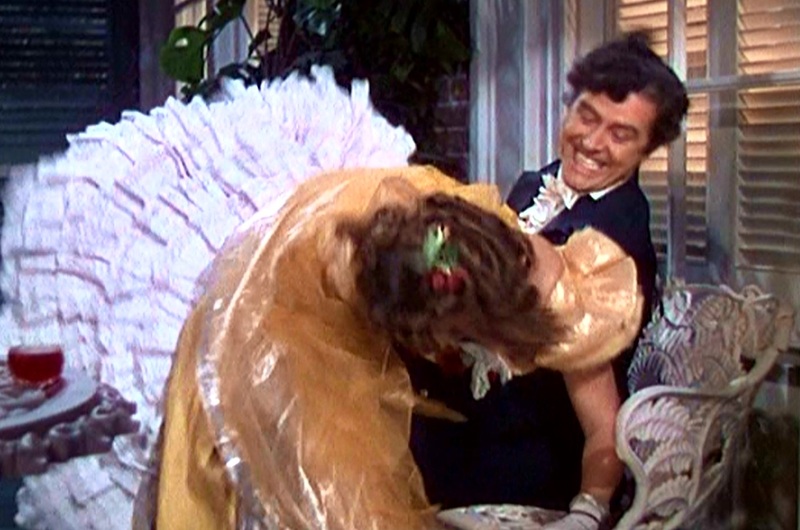 In fact, the two roles are so similar that they both call for the actress to be the horizontal component of a spanking scene. So which job should she choose: cinema or live theater? You might think that’s a no-brainer. 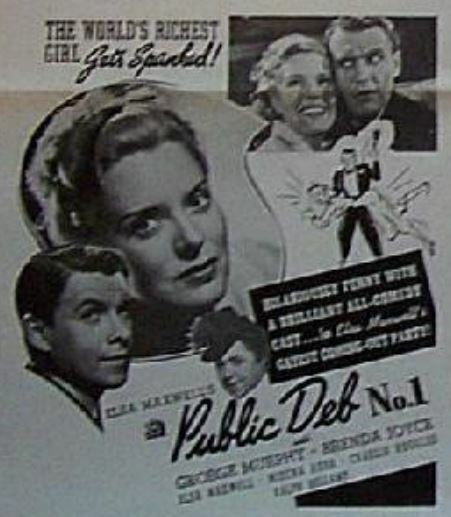 In the theater, the actors must repeat their performances afresh for each new audience, sometimes with inevitable slight variations, whereas every movie audience sees exactly the same set of performances, which have been recorded and are repeated by means of mechanical reproduction rather than human labor. 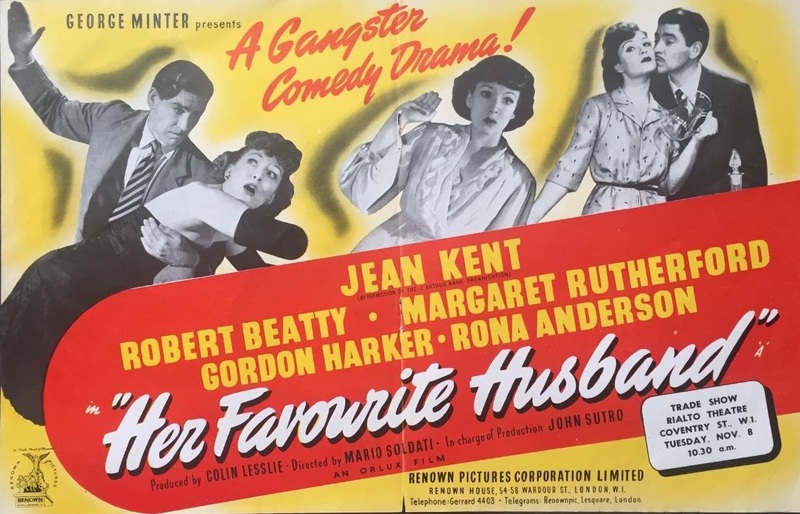 So it would seem that the choice facing our imaginary actress is between being spanked eight times a week, including matinees, for however long the play runs, or being spanked just once for the movie camera. Actually, it’s not nearly so simple. A visitor to the set that day described what happened. Naturally they started with a rehearsal. Milland turned Paulette over his knee, and her period hoop skirt tilted right up, presenting him with her lower half in long, frilly pantalettes, which he proceeded to spank – hard! 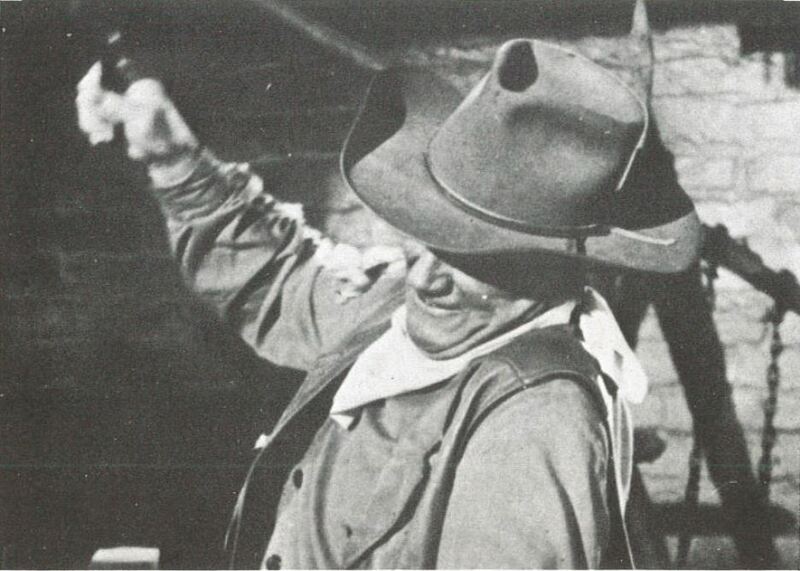 Paulette wasn’t expecting that, and she responded to the full force of his performance with an almighty ‘Hey!’ The director, Cecil B. DeMille, intervened to point out that her line was actually ‘Stop it! How dare you? Stop it, I say!’, and that ‘Hey!’ was perhaps a little out of period. ‘Well, he doesn’t have to give me a real spanking in a mere rehearsal, does he?’ replied Paulette; ‘I wasn’t even prepared.’ And Milland apologised for getting carried away. So what Paulette was expecting of the rehearsal was a simple run-through of the moves, with a more authentic performance reserved for when the camera was rolling. Because the other thing the photo tells us is what the issue was. You will have noticed that the demonstration doesn’t match the actual movie scene. 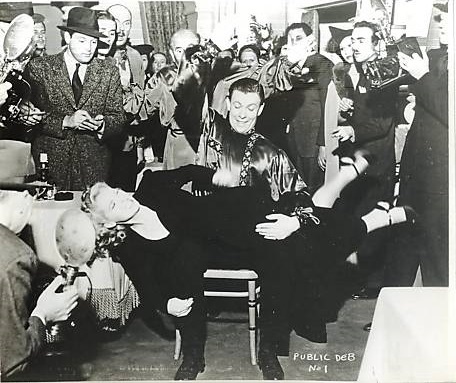 DeMille didn’t take the time to put Paulette across his knee: he just concentrated on the thing he wanted to demonstrate – and the motion blur on his right hand shows what that was. 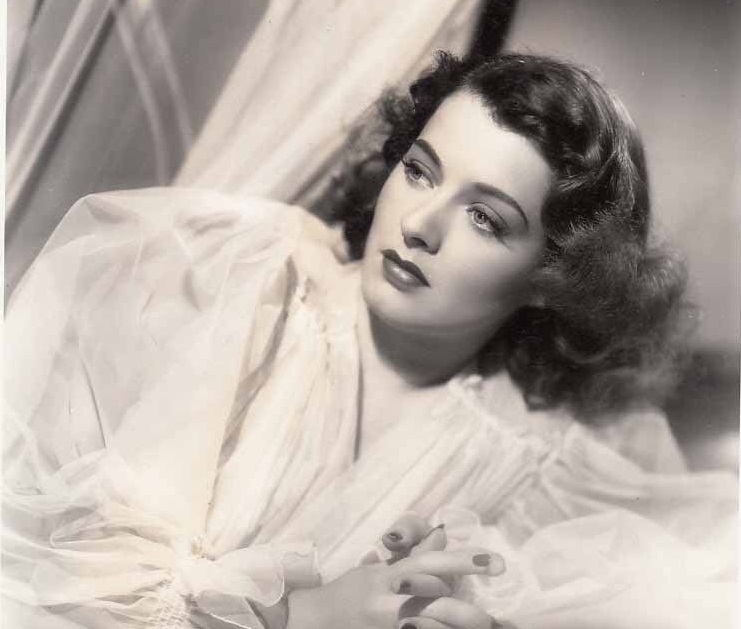 What he wanted from his actor was evidently a vigor of the kind that, in their next movie together, Paulette Goddard would disingenuously suggest was unnecessary in ‘a mere rehearsal’. And by the time the cameras rolled for the first take, she had already been spanked nine times in rehearsal! So once again, the actress was spanked at least three consecutive times in rehearsal, before going on to be spanked on camera shortly afterwards. 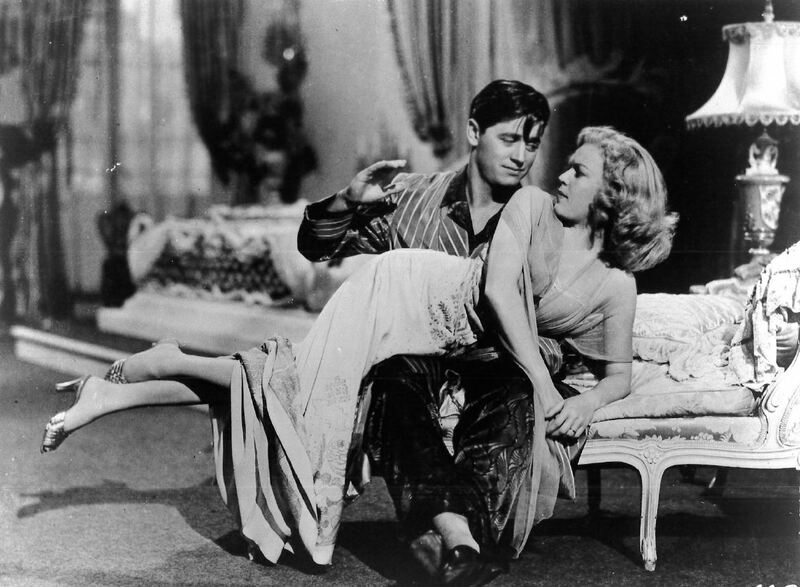 But on the day of shooting, Cooper just couldn’t bring himself to strike a woman, and no amount of rational persuasion, by Claudette as well as director Ernst Lubitsch, could make him change his mind and play the scene. 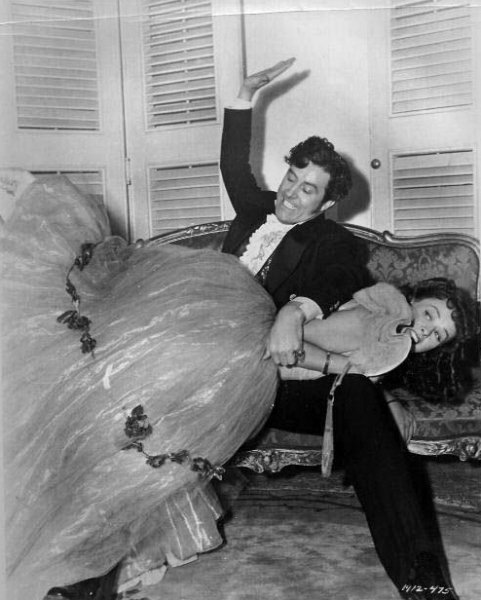 Then Claudette tried a different approach, and slapped his face hard. ‘Turnabout is fair play,’ she said. ‘Now maybe Gary will agree to give me that spanking.’ Whereupon Cooper withdrew his objections: ‘It will be a great pleasure,’ said he. The irony is that, in giving half-hearted performances in rehearsal, these polite, reticent actors only prolonged things for the co-stars whose feelings they were instinctively trying to spare! When, eventually, the director and actors knew what was required and how they were going to achieve it, it would be time to go for a take. 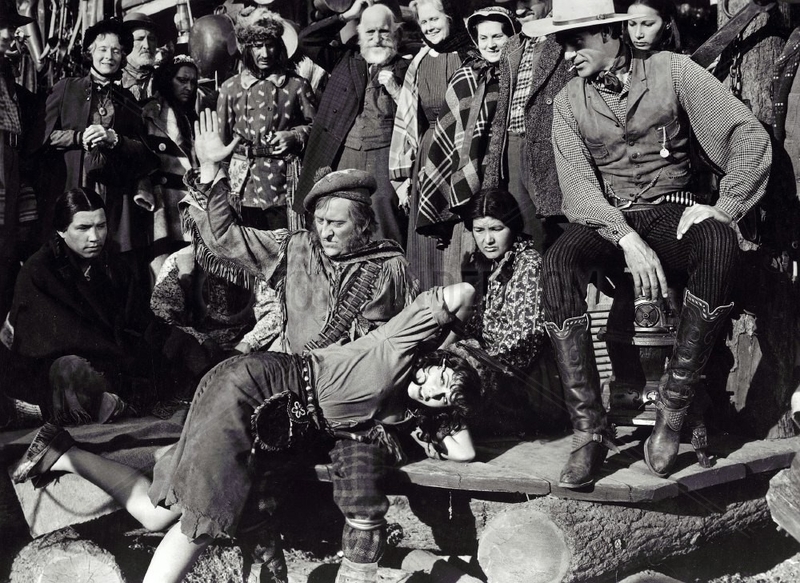 For an example of this process in action, let’s return to the set of North West Mounted Police, where Lynne Overman is putting Paulette Goddard across his knee, watched by none other than Gary Cooper, owner of the brown boots on the right of the shot. He gives her a single smack, and then she’s saved by the intervention of a Mountie. 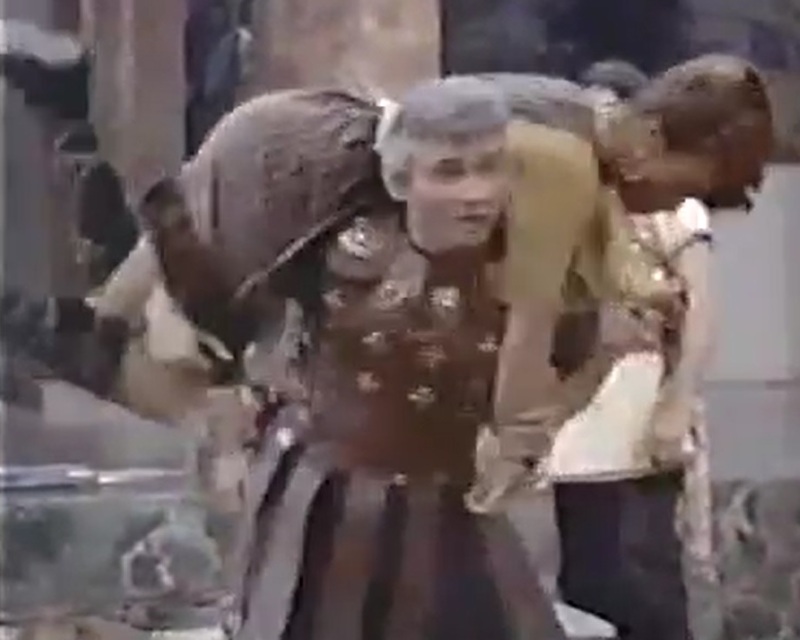 Just look at where her body is relative to his plaid breeches in that shot, and compare it with her position in the master shot: these are obviously completely different and somewhat discontinuous camera set-ups. The big point I’m making here is that, in the movies, scenes aren’t played completely in real time, and this can be manipulated to the advantage of the actress who has to be spanked. 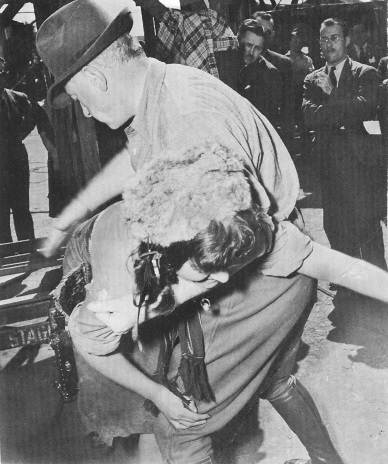 The spanking in North West Mounted Police was created more in the editing room by film editor Anne Bauchens than it was by the actors on set, where Paulette Goddard only got the absolute minimum necessary to establish what was happening. As you can see there, her hands are already behind her head, but the reason isn’t to obscure her face. On the contrary, she’s putting her arms out of the way so that when she has her close-up, you will be able to see her face! So let’s forget this nonsense about a body double and simply register that the spanking is, mostly, a cleverly constructed fake. Back now to the set of Reap the Wild Wind. The story so far… Paulette has already been soundly spanked once that day for the rehearsal, and she’s not happy about it. While she’s at the wardrobe department for some minor adjustments before the take, let’s think about a few ways in which this spanking scene is going to be different from what she experienced a few years earlier on North West Mounted Police. The most important one, in terms of how the scene will end up in the finished movie, is that the spanking takes place in an entirely different context. Whereas Louvette is spanked in public, with a crowd looking on, the scene with Loxi is essentially private: to be sure, she’s on a balcony next to a ballroom, but the partygoers think the man with her is about to be announced as her fiancé, so they aren’t going to barge in and disturb her at this intimate moment. This has two consequences for the spanking. Firstly, since only the two participants are there, nobody will intervene to put a stop to it, so this is going to be a longer spanking than the interrupted one Paulette got in North West Mounted Police. And secondly, the cinematography will have to be different, because with no onlookers there are fewer options for relevant inserts to break up the master shot. A lot more of this spanking will be done in real time, and a lot less of it will be pieced together in the editing room by the redoubtable Anne Bauchens. Let’s look at it in detail. Here’s the master shot, in which progressive layers of Loxi’s dress tumble down to reveal her elaborately frilly petticoats. 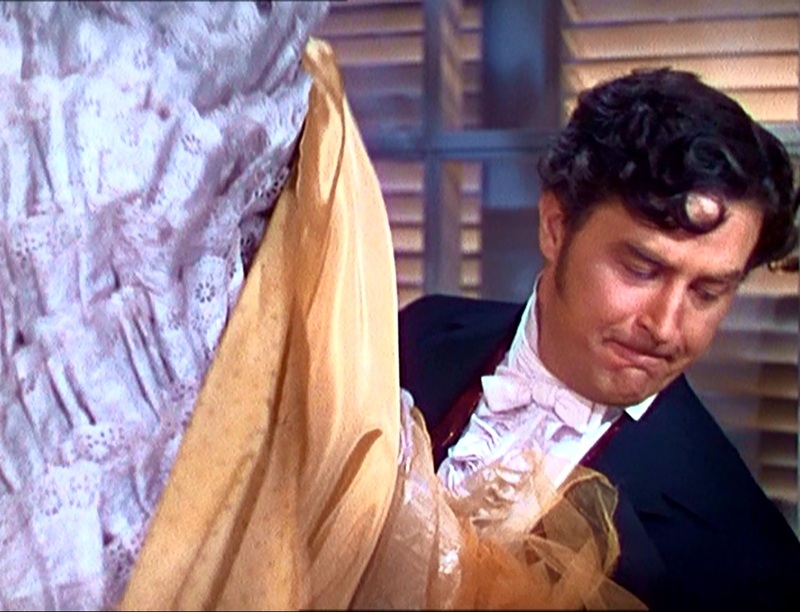 The petticoats are as far as we are allowed to go: the angle of the shot was obviously chosen to avoid revealing the even more intimate apparel beneath. But that means there is only one possible insert shot. There’s no point in having a close-up of Loxi’s facial reaction, because that’s already taken care of in the master. So most of the spanking – seven smacks, to be precise – has to happen in this shot. The insert accounts for the other two smacks of a nine-smack spanking, and is of course a close-up of Ray Milland as he spanks. But again, what was possible in North West Mounted Police was out of the question this time, thanks to Paulette’s costume. 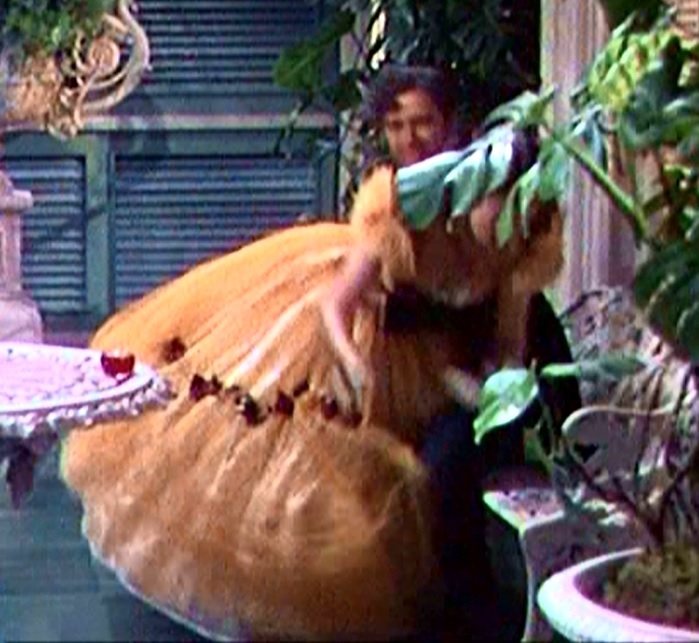 Because the crinoline is, in effect, a self-raising skirt, it will be in shot for Milland’s close-up. 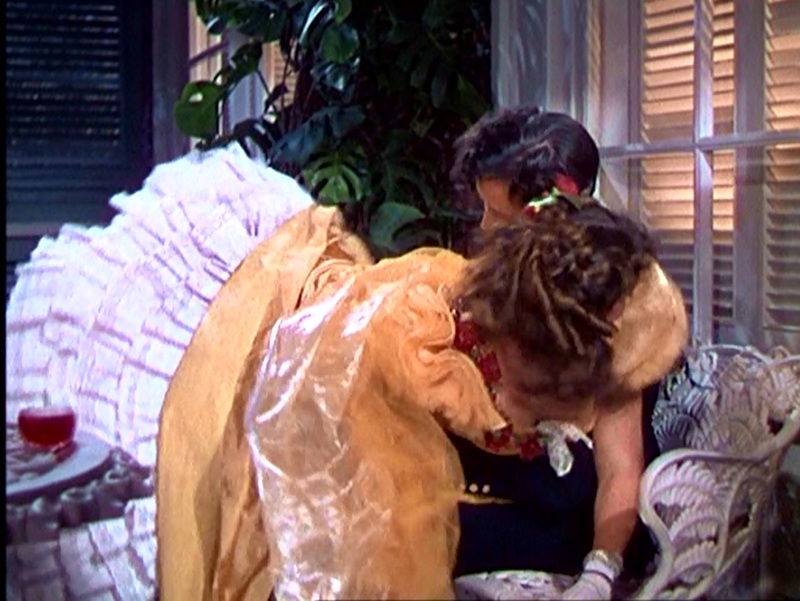 And because Paulette is still wearing the costume (ready for the next component shot), there’s no alternative: she must still be across Milland’s knee, even though all we can see of her is her skirt and petticoat! … but the reality was that she was going to get a spanking on her underwear. And she’d already had a taste of the likely intensity of that spanking in the ‘mere rehearsal’ at which Milland got carried away with his performance. The camera couldn’t see the temporarily less than shapely seat of Paulette’s pantalettes, but it was obvious to everybody on the other side of the set that Milland carefully avoided any impact of his hand on her bottom! The sound of the smacks was put on the soundtrack later by the foley artist. 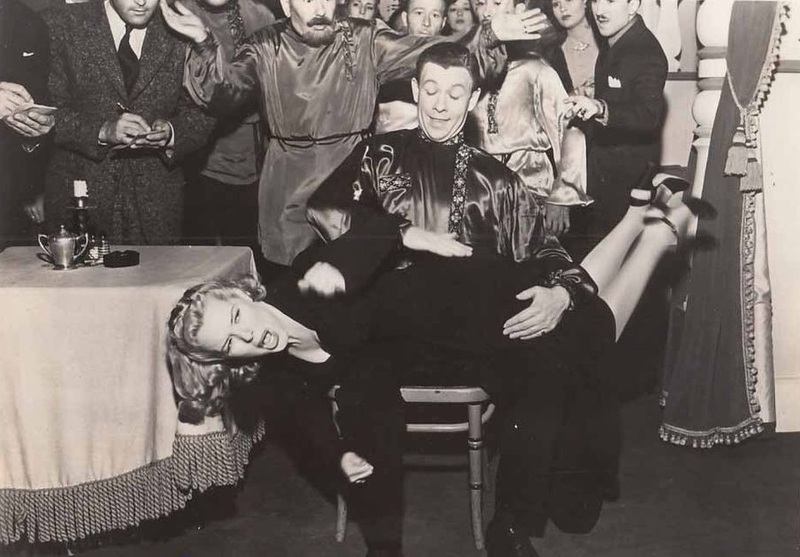 So the import of what we have seen so far is that the artificiality of the cinema medium gives movie makers a whole range of tricks that can save an actress from having to undergo the discomfort of being soundly spanked. 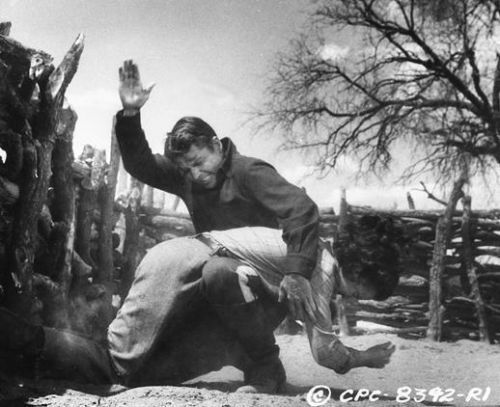 In fact, variants of the technique used by DeMille in North West Mounted Police were used in some other movies, notably for the first spanking in Dos Pistolas Gemelas (1966). 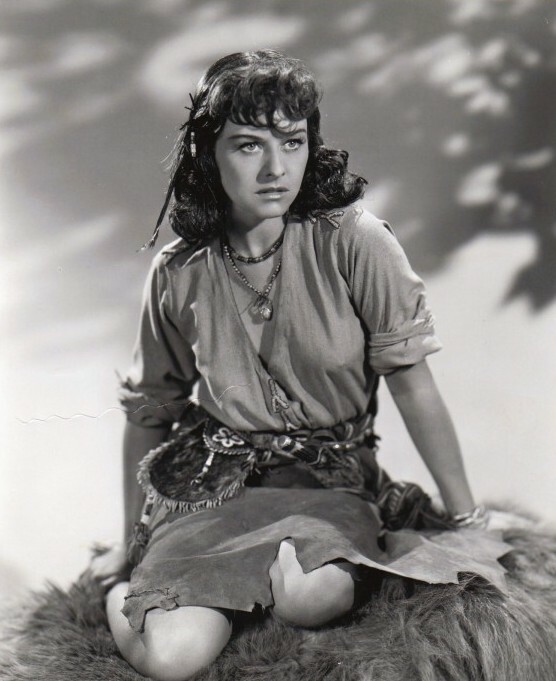 But it helpfully illustrates the kind of thing that Paulette Goddard got in 1940, and was perhaps expecting, or hoping, to get once again in Reap the Wild Wind. Shot 1 establishes that the lady is about to be spanked. But by cutting to close-up when the man’s arm is halfway down, the actual moment of contact is avoided. With the lady out of harm’s way, the spanking action can now continue in Shot 2. 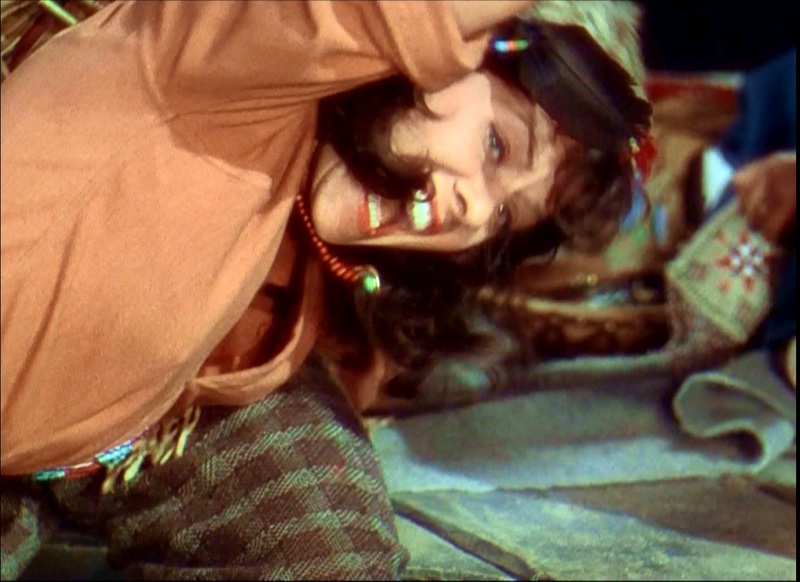 A cut to another close-up, showing the victim’s anguished reaction (Shot 3), adds to the effect while allowing the audience to imagine that the action is still going on outside the frame area. Finally the illusion is completed by cutting back to a re-establishing shot (Shot 4) of the whole scene when the man’s arm is traveling up. Now, you may rightly point out that this bears absolutely no relation to the way the spanking scene in McLintock! is actually presented in the film. 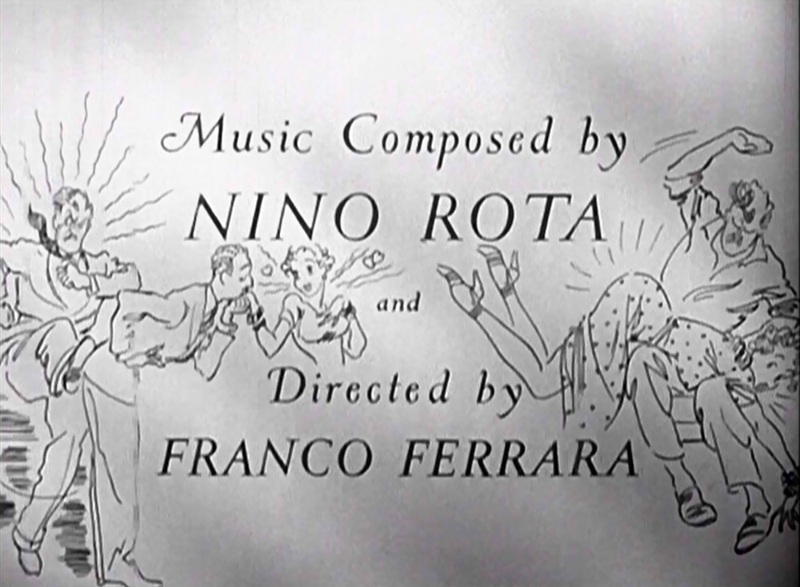 Yes, there are some cutaway shots, but the director and star do not seem to have given a very high priority to sparing Maureen O’Hara from the need to suffer for her art. So what this really tells us is that you can’t generalize. 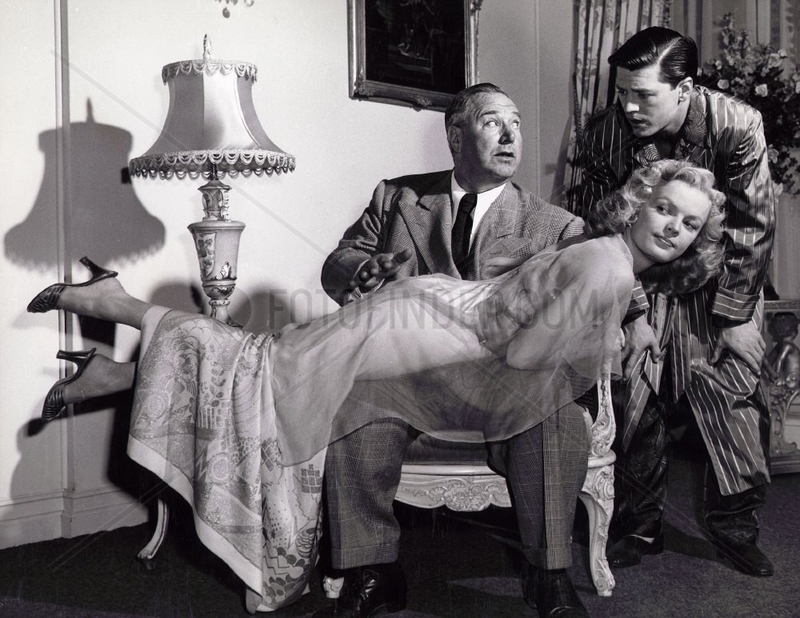 Some productions certainly were organized with a modicum of concern for the spanked actress’s comfort. Others seem to have treated such scenes as just one of the less agreeable parts of her regular professional responsibilities. And from time to time, things may have been a little more personal. Came the day, began the rehearsal. And the first rehearsal ended after just one smack. ‘I can’t play the scene this way,’ insisted Jones. ‘It isn’t realistic: Miss Foster is padded.’ She had indeed taken such precautions, and work on the scene resumed after the removal of the extraneous excelsior – whereupon Allan Jones got his revenge! … Jane Powell told a reporter that her tears were real, ‘and I won’t be able to sit down for a week’. That, of course, is why full-on performances sometimes needed to be coaxed out of reluctant actors. 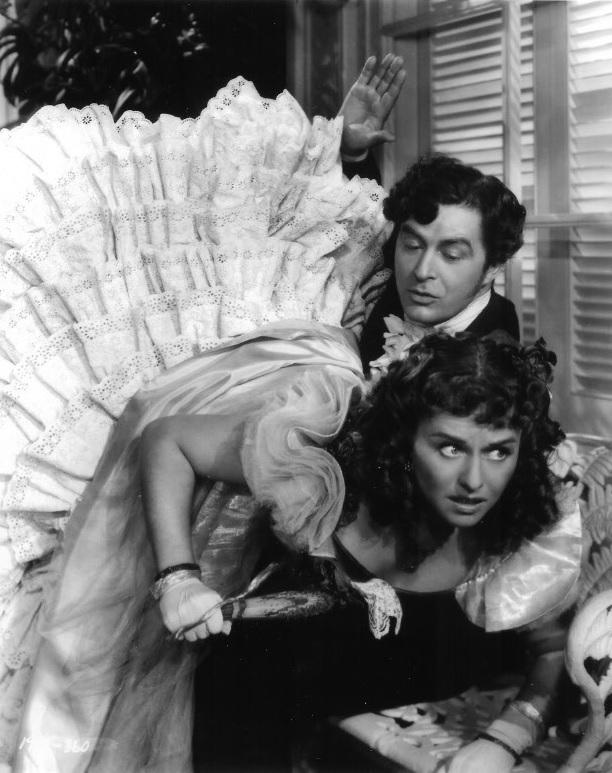 Even Paulette Goddard seems at first to have accepted that she was going to get ‘a real spanking’ when it came to a take, at least until Ray Milland used up the professional goodwill on that ‘mere rehearsal’. So when a director decides a spanking scene needs to consist of more than one shot, it’s not necessarily good news for the actress, because the additional shots aren’t necessarily going to be the kind of crowd reaction shots or close-ups that extend the scene without extending her ordeal. This isn’t an unimportant moment in the overall story of the film. Being stuck in a biopic of her own life and unable to predict the future, Marilyn doesn’t know that Sally is the show that is going to make her name. But the audience can see that she is about to turn her back on success, so the spanking that changes her mind is a moment of historic destiny. 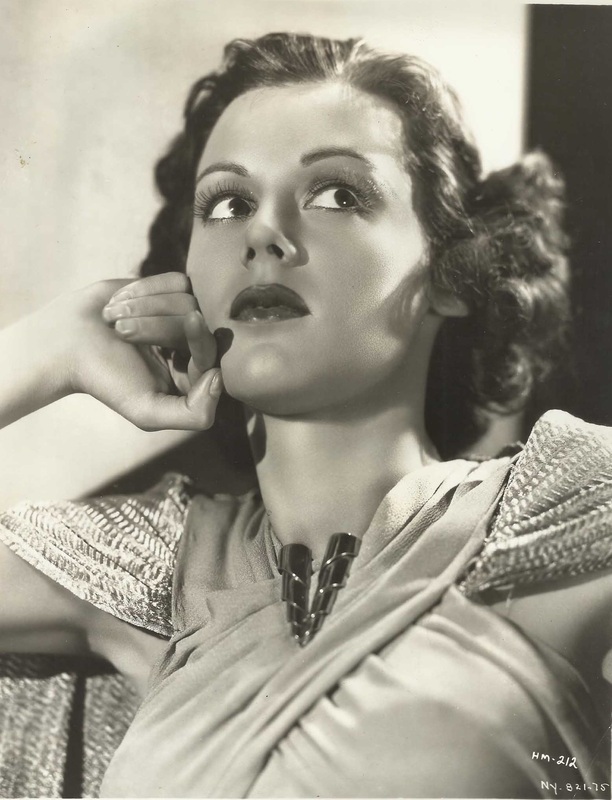 It is, in fact, the reason why there can even be a biopic of the life of Marilyn Miller! 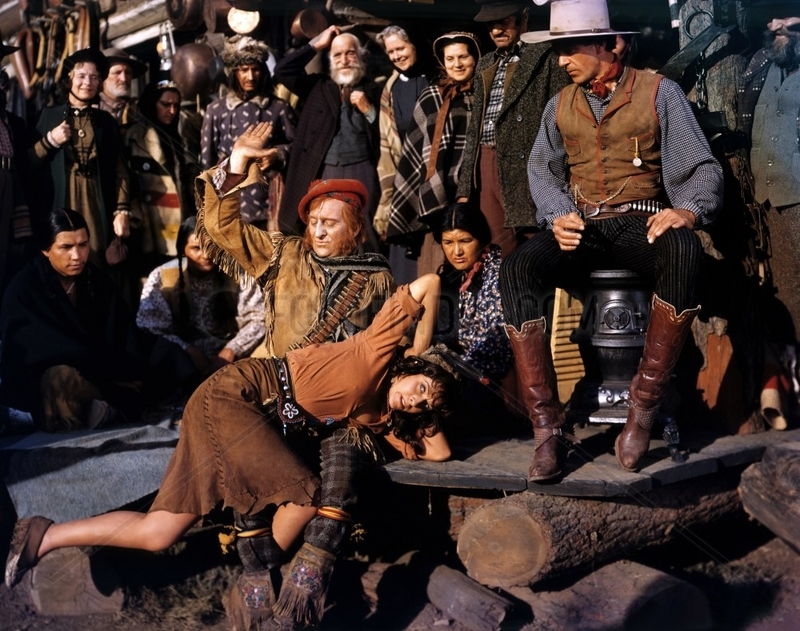 That begins to explain why it’s a sequence that needed to be carry some weight, why it’s not only an exciting spanking scene but also, by Hollywood standards, a relatively long one amounting to eleven smacks – which is nearly double the onscreen hit rate for McLintock! And that interruption saves both Marilyn’s bottom and her career: Frank has to stop spanking her so that the maid can deliver the message, but she’s still over his knee and he makes it very clear that she’ll be getting some more if she doesn’t send back the right answer. And so she sobs, ‘I’m going to do Sally,’ and her future is assured. 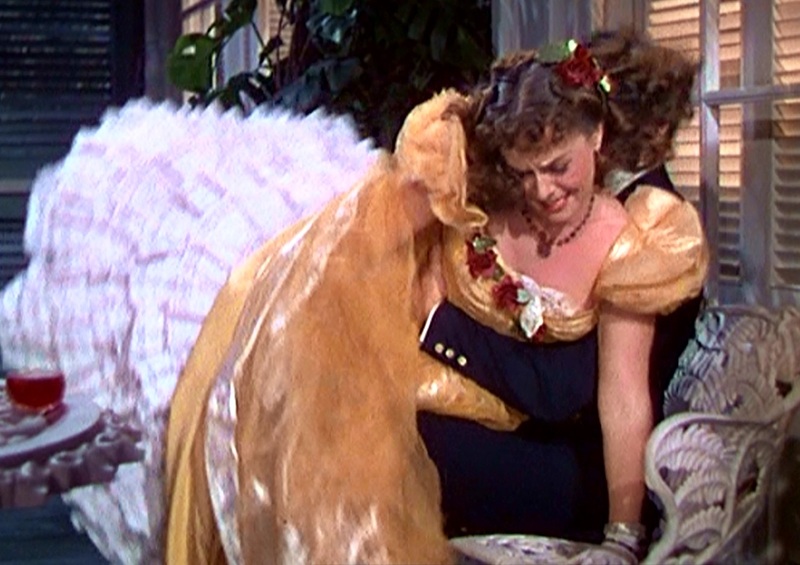 The point I’m making is that there are often good artistic and technical reasons to change the shot while the spanking is going on, but they have nothing to do with the comfort and convenience of the actress. Quite the opposite, in fact. Because each time there’s a new shot, the camera has to be set up again in its new position, and the set has to be relit accordingly. There’s bound to be a delay – and then, maybe half an hour later, the actors start again. So when a spanking is done across two shots, from the actress’s point of view it’s more like getting two spankings, one on top of the other. And that’s not counting the rehearsals! And there’s another factor we haven’t considered yet. When Ellen Drew started work on Our Wife, a reporter got wind that she was going to be spanked in the final scene, and remembered that the movie’s director, John M. Stahl, had the reputation of being a perfectionist. Such a perfectionist, in fact, that if he wasn’t satisfied with a scene, he’d go on shooting even if it took until Take 75. In the event, it didn’t go anywhere near that far. The nine rehearsals of the spanking scene were followed by four takes, meaning that Ellen was spanked, and spanked hard, a total of thirteen times in the course of an hour and a half. 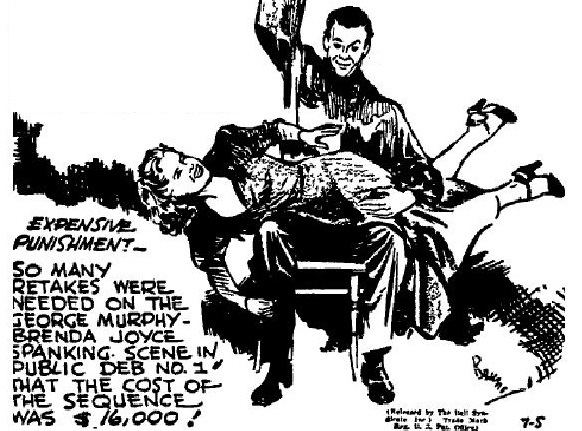 The newspapers reported that she got ‘an eight-hour spanking’ in Sign of the Pagan (1954). Unfortunately that’s not really a shining example of accurate journalism: yes, the scene took eight hours to shoot, but no, it wasn’t a spanking in the strictest sense of the word. 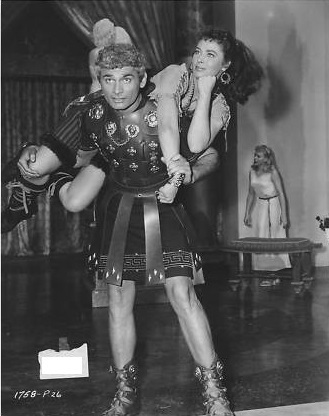 It’s actually a fight scene with Jeff Chandler, in which she gets periodically whacked on the bottom with the flat of his sword, then thrown over his shoulders and carried away with her legs aflutter. Even though it’s not a proper spanking scene, it’s enjoyable to watch (you can do so here). But it was a grueling day’s work for Rita: she told an interviewer that she could only sleep that night after taking two hot baths, and was black and blue for days. Just watching the scene made her feel the sting in her derriere all over again! Someone who really did spend an entire day being spanked was Martha O’Driscoll. 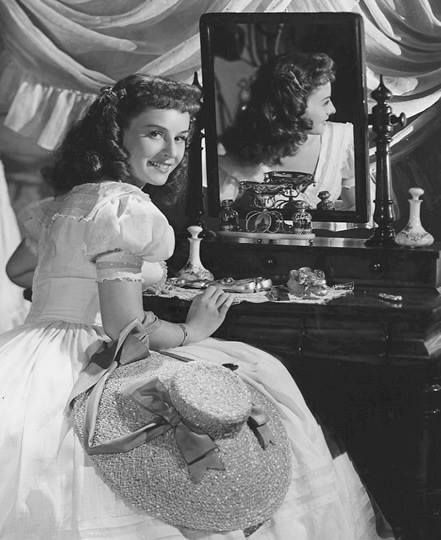 And as take followed take, Martha got sorer and sorer, until it became necessary to fix her up with an ice-bag bustle to wear between shots. She stayed relatively lucky in the fact that this scene didn’t take all day. She couldn’t sit down afterwards. And that’s where her luck really ran out. If it had taken a whole day of spanking, she wouldn’t have been required to go straight on to the next scene on the shooting schedule… and spend the next three hours riding on horseback! But that pales in comparison to what happened, also in four takes, to an otherwise unknown blonde actress using the name Tanya Zhivago – which is obviously a pseudonym compiled from two of the major characters in the 1965 David Lean film Doctor Zhivago. Her only screen credit is for a 1968 movie that is almost as obscure as she is, entitled We a Family. 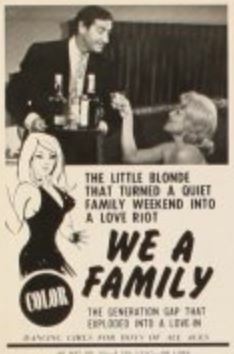 The 1960s saw the decline of the spanking scene in mainstream American cinema, but also the rise of the low-budget exploitation film, of which We a Family was an example. Now, I haven’t seen this film and to be honest I don’t particularly want to: the spankings in this genre are usually pointless and tawdry. They are also usually on the bare bottom, and this is what lends a certain piquant interest to the fact that the director only called ‘print’ after the fourth take… by which time, we are told, Tanya Zhivago had a very red bottom indeed! 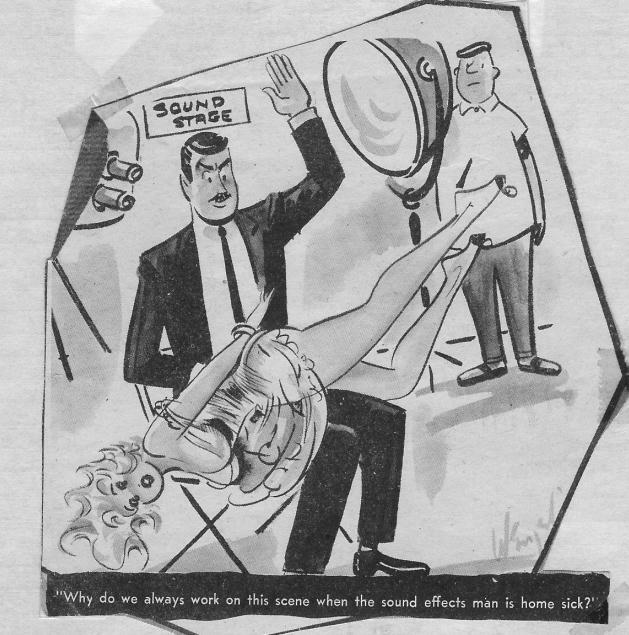 The studio commissioned a caricature painting of the scene for use in publicity. ‘Is her face red?’ Yes, and so are her political opinions. And so, probably, is something else. Because it required seven takes to get the spanking scene right. 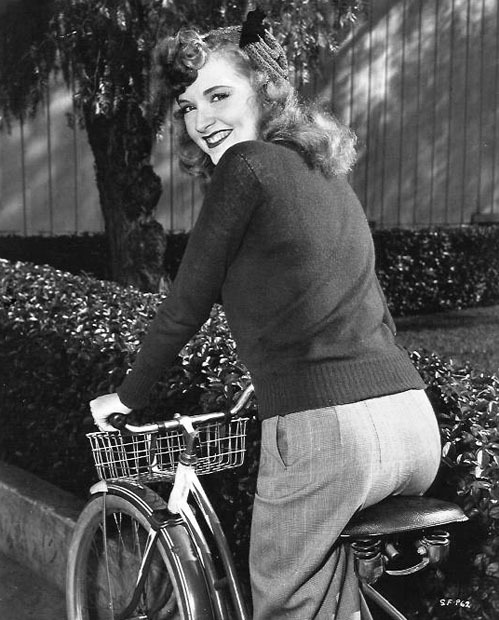 By the final take, reported one newspaper, ‘Brenda didn’t have to do much acting to suggest a thoroughly spanked young woman.’ Another named her as ‘the most spanked player in Hollywood’. But she didn’t keep that title for long. 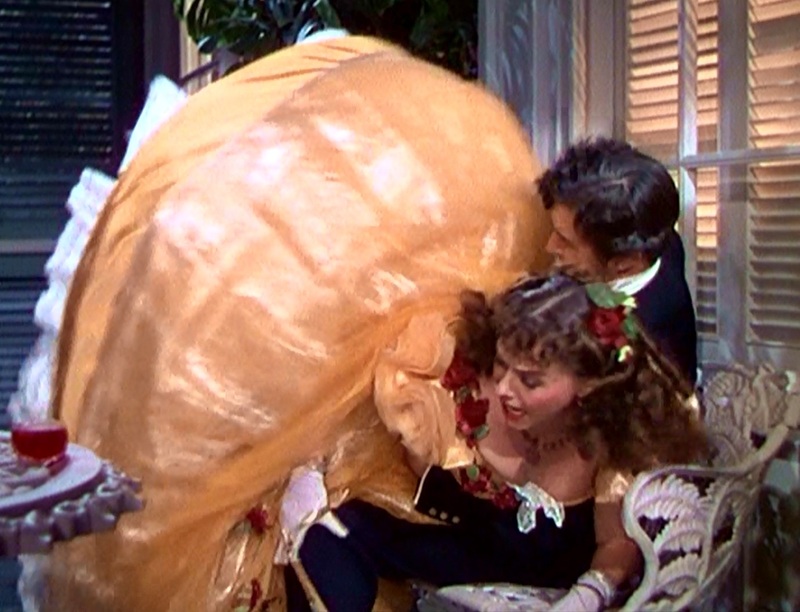 The following year, Susanna Foster, after being deprived of her foam-rubber bustle, had to play her There’s Magic in Music spanking scene for a staggering 21 takes before director Andrew L. Stone was satisfied! If you were to gratify yourself by deliberately doing your job badly, and consequently cost your employer more than a quarter of a million dollars (the modern equivalent of $16,000 in 1940), then you would deserve to be called unprofessional. 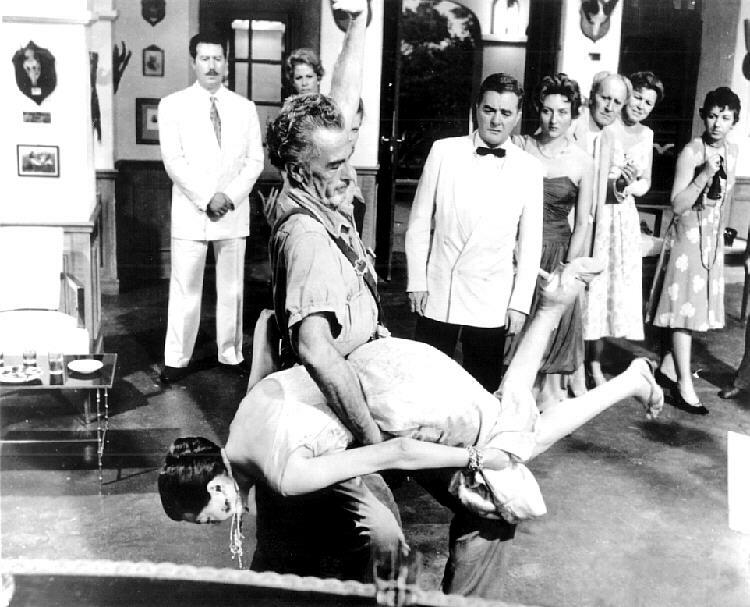 In reality, the need for a large number of spanking retakes doesn’t show that the cast or crew particularly enjoyed doing them. What it shows is just how difficult it was to get a spanking scene right. But on occasion the financial factor worked in the actress’s favor. 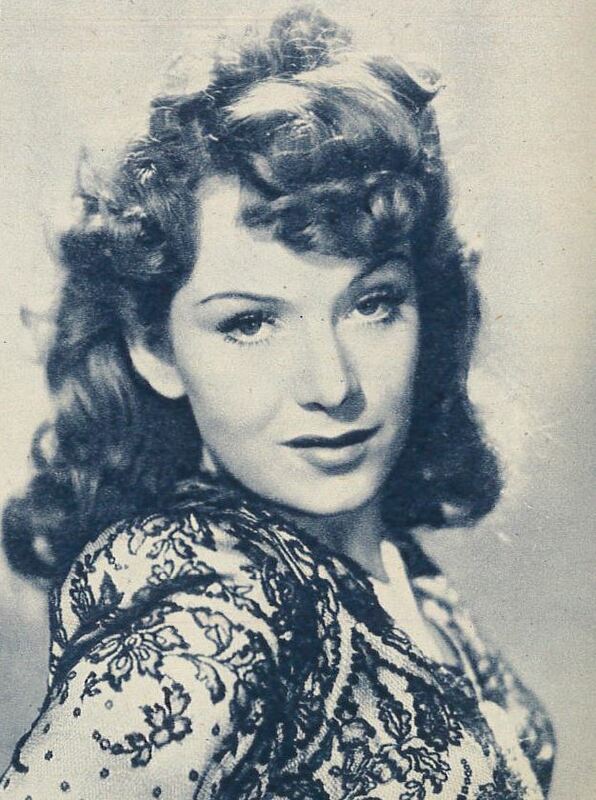 Time now to meet the British movie star Jean Kent. 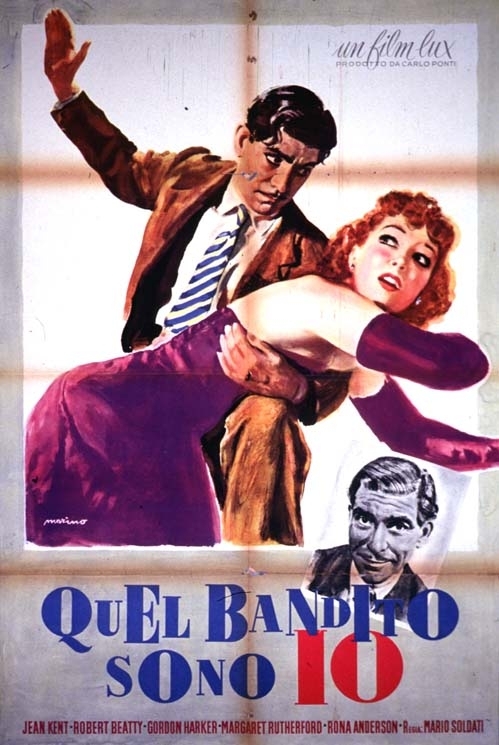 So it was a blow when the British Board of Film Censors decreed that the ‘undignified and unbecoming’ spanking scene couldn’t be allowed as it stood. A planned screening for the trade, scheduled for November 8, was canceled while the producers had a rethink. The obvious solution was to recall the actors and reshoot the scene. Reports of the estimated cost of this ranged from a bare minimum of £400 up to £2000 (in modern terms, £13,000 to £64,000). The higher figure is much the likelier, because the film was made in Italy: the actors would have to be flown out for the reshoot, or (if it was done in England) a set would need to be designed and built to match the existing footage. And £2000 represented a not insignificant chunk of the film’s overall budget of £18,000. The two images are identical. So the scene was not reshot after all: the producers saved £2000 (or £400, take your pick), and Jean Kent was spared a second spanking. 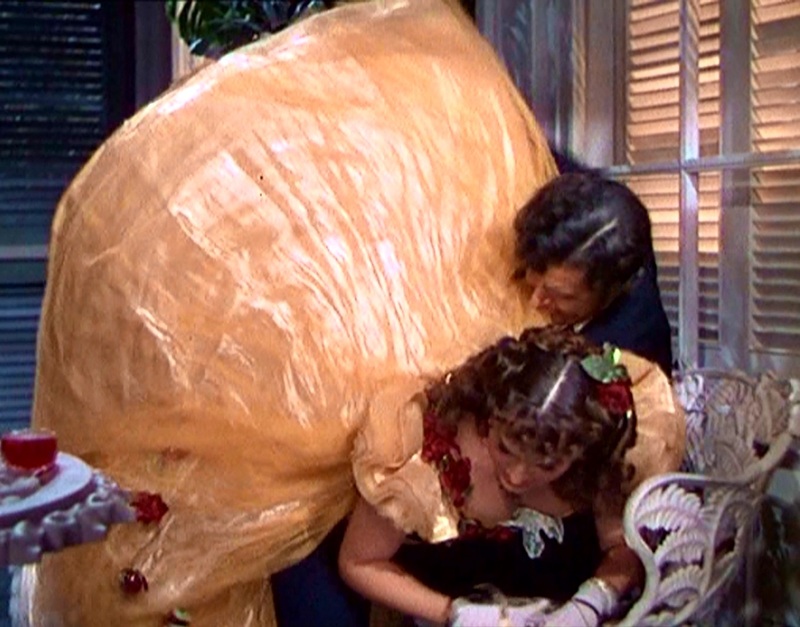 Further discussion with the censors established that the main objection was not to the visuals but the explosive sound of the six smacks landing on Dorothy’s bottom. So the sound men found a way of dampening down the soundtrack to the Board’s satisfaction – thankfully without overlaying the honking sound of a motor horn mooted in the Daily Mirror article! We started out with a hypothetical actress having to choose between spanking scenes on stage and on screen. 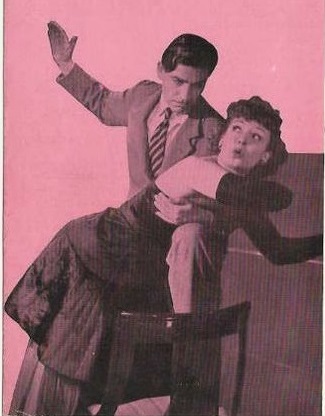 The theatrical option was always straightforward: she’d be spanked every time the play was performed. But what we’ve discovered is that the cinematic option is much more of a gamble. She might get away with being spanked just twice, once for rehearsal and once for a take – with the chance that her fellow actor might go easy for a ‘mere rehearsal’. She might even be allowed to install some protection for her nether regions. But equally, she might end up doing repeated, realistic rehearsals, with the further risk of having to do retakes. And if John M. Stahl was directing, and things didn’t go according to plan, she might even wind up getting spanked 75 times, all on the same day! One actor well equipped to make the comparison between the two media was Owen Davis Jr, who made a few films in 1929-30, most notably All Quiet on the Western Front, but then returned to Broadway for five years. 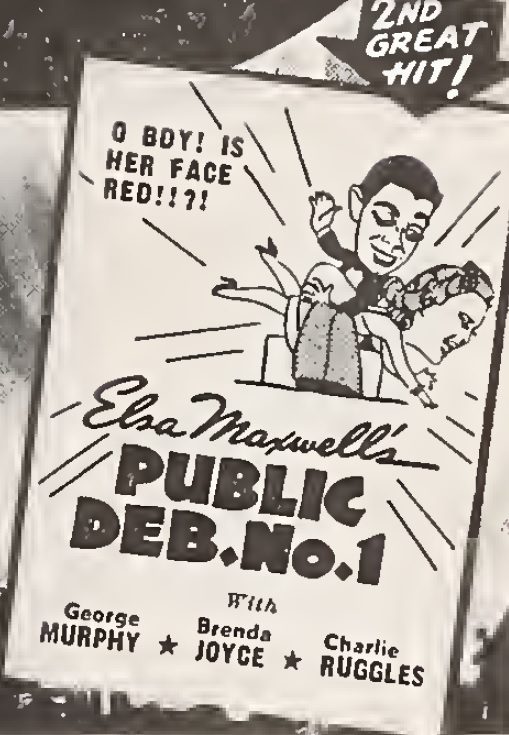 In 1936, he was wooed back to the movies to play the title role in Bunker Bean, the film version of a 1916 stage comedy about a man with an inferiority complex who discovers that he was Napoleon in a former life. His leading lady was Louise Latimer. But perhaps not quite as hard as it was on a different part of Louise Latimer. What a great article. I loved all the film references and esp. all of the spanking scenes you showed. I really had no idea that so much time went into a scene that spankos decry for their brevity and that it is not a true spanking, but you have now told us that they were indeed real spankings and the actress really did suffer for her art. I also love the scenes that you showed quite a lot of the different angles as well as different spankers. I would think though in a way that some of the spankers and spankees would also know how to get it done better as some of them were spankers or spankees in more than one instance. Paulette had not only several spankings in cinema, but also in several photo shoots for publicity stills that were not even in the movies (SUDDENLY LAST SPRING and THE FOREST RANGERS ) come to mind and didn’t June Haver get a publicity spanking in (I WONDER WHO’S KISSING HER NOW) and as far as the spankers go Melvin Douglas and others like Tim Holt did seem to appear in a lot of mainstream spanking movies or plays. (lucky guys) that they would know how to spank as I do think it had to be a little of all three director, actress and actor to make the scenes last longer. 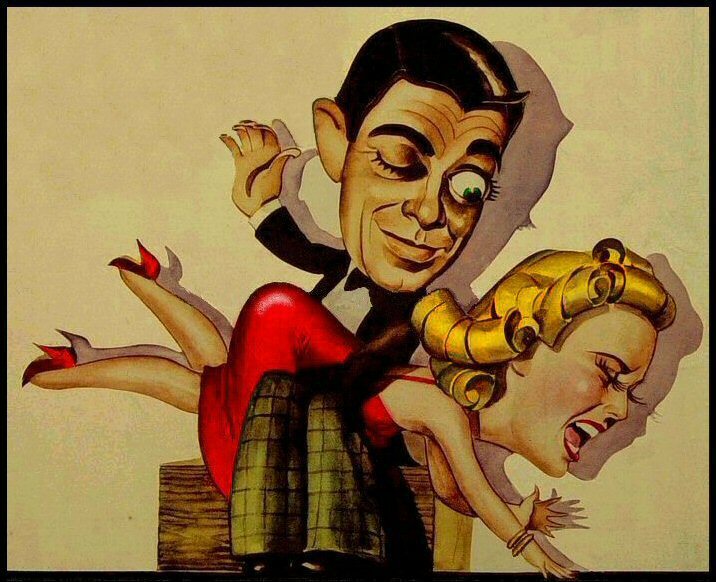 Which brings up new topics WHICH ACTOR GAVE THE MOST SPANKINGS; WHICH ACTRESS GOT THE MOST SPANKINGS; WHICH WRITER WROTE THE MOST SPANKING SCENES IN MOVIES AND WHICH DIRECTOR DIRECTED THE MOST SPANKING MOVIES? Thanks again for all your time and resources in these articles. This is a staggeringly good piece of work. Thank you very much for the time and downright scholarship you put into these. Your pieces are invariably interesting, but this is the best yet. A tremendous piece of work. Excellent piece, thanks for all your work putting these articles together.